According to reports, Russia’s Investigative Committee has confirmed an eyewitness account of a Ukrainian warplane being deployed on the day of MH17′s subsequent downing. 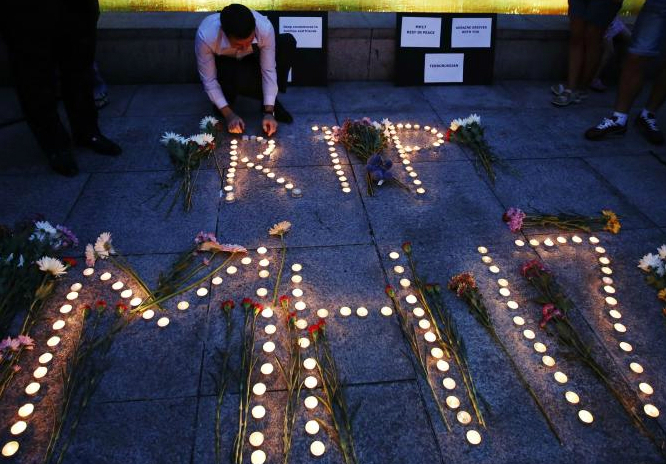 In July of 2014, 21WIRE compiled a special MH17 report with the help of many contributors. The intent of that report and an earlier report about the downed Malaysian Airliner was to provide as much information as possible regarding the tragic event. Immediately following the incident, Independent investigators noted that ATC audio records of the MH17 flight had been confiscated by the Kiev government. Those in Washington chose not to acknowledge this crucial detail at the time. It should also be mentioned that during that time, Putin condemned the plane attack when it was first announced, calling for a ceasefire between what Washington refers to as ‘pro-Russian separatist’ rebels and Kiev’s Western-backed Ukrainian armed forces in the wake of MH17′s downing – the third such ceasefire proposal which Washington worked hard to undermine, preferring to politically and financially fuel the Ukrainian civil war from the outside. Although there was much media propaganda about who held MH17′s black box, the box was handed to Dutch and the British authorities after the Malaysian authorities had acquired it in the aftermath of the crash. Why have authorities not been transparent about MH17′s communication with Kiev ATC prior to the plane’s downing? The recent unearthing of MH17, comes on the heels of former French airline CEO Marc Dugain claiming that the United States may have ‘stopped’ (shot down) missing airliner MH370, as it traveled through airspace near Diego Garcia. ← WOW!!! Exopolitics v. Kevin Annett?